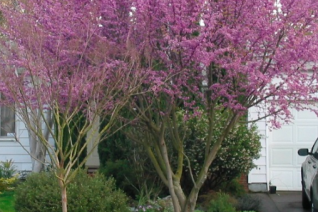 Western Redbud is a wonderful showy spring blooming tree that gets by on no summer water. Native to California also Utah, Arizona this is primarily a large shrub in the wild. We have found in our climate with a longer rainy season it forms a small tree. In April this entire tree comes to life smothered in tiny but profuse magenta pink pea flowers. They line all the stems and even appear on the trunk. After three weeks of glory the handsome new leaves appear. Round and blue green they have a slight rubbery texture. To 14′-18′ tall and forming a spreading crown. Fall color is orange to yellow but not reliable. Large purple colored seed pods are showy and persist after the leaves have gone. Moderately fast growing (2′-3′) per year when happy. Full sun and well drained soil of average fertility. Water through the first summer to establish then no summer water in subsequent years. Thrives in our climate.